Opening Night for the 2017 Tribeca Film Festival at Radio City Music Hall, New York City. NEW YORK CITY – Wednesday, April 19th, 2017, was the Opening Night for New York City’s preeminent film happening, the Tribeca Film Festival. 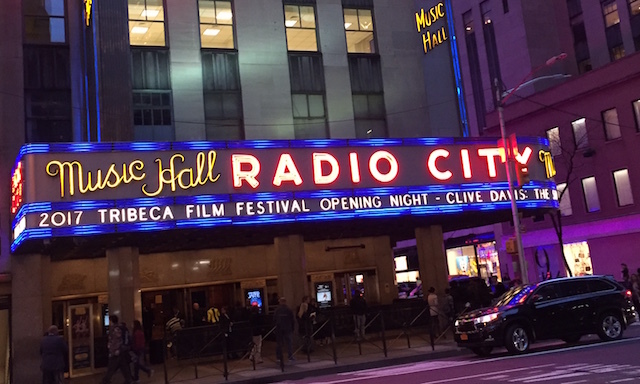 This is the 16th edition of the ever-expanding fest, and the legendary Radio City Music Hall in Manhattan was the setting for the opening night film, “Clive Davis: The Soundtrack of Our Lives.” Mr. Davis is one of the legendary music men, having run Columbia Records, founded Arista Records, and continuing today as Chief Creative Officer for Sony Music Entertainment. CHICAGO – I must admit that my fandom for Bruce Springsteen played a factor in how I responded to a review outreach for “Springsteen & I,” playing in special engagements around the country, including tonight, July 22, 2013 at AMC River East 21 and Regal City North 14 in Chicago (and again on July 30). If it had been called “Nickelback & I,” I probably wouldn’t have responded. CHICAGO – Mickey Rourke’s multi-award-winning performance in “The Wrestler” anchors one of the best films of 2008, now released on Blu-Ray and DVD. If you haven’t seen the film yet, you truly must do so as soon as possible, and if you love the movie like so many people do, you’ll be satisfied, if not overly impressed, by a decent HD release. CHICAGO – Stories are released every year about the gap between the Oscars and public opinion. It’s a chasm that seems to be growing with every passing year. President-Elect Barack Obama and Michelle Obama at We Are One: The Obama Inaugural Celebration At The Lincoln Memorial presented exclusively by HBO on Sunday January 18th 2009. CHICAGO – This 39-image slideshow contains a selection of official press images from HBO’s “We Are One: The Obama Inaugural Celebration at the Lincoln Memorial,” which took place on Sunday, January 18th, 2009 in Washington, DC.